Changes over time in the presenting features and clinical course of patients with primary biliary cholangitis are poorly described. 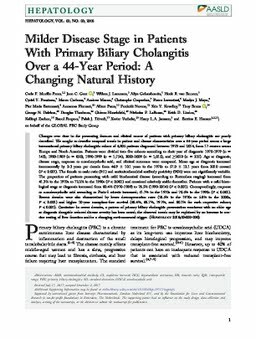 We sought to describe temporal trends in patient and disease characteristics over a 44-year period across a large international primary biliary cholangitis cohort of 4,805 patients diagnosed between 1970 and 2014, from 17 centers across Europe and North America. Patients were divided into five cohorts according to their year of diagnosis: 1970-1979 (n = 143), 1980-1989 (n = 858), 1990-1999 (n = 1,754), 2000-2009 (n = 1,815), and ≥2010 (n = 235). Age at diagnosis, disease stage, response to ursodeoxycholic acid, and clinical outcomes were compared. Mean age at diagnosis increased incrementally by 2-3 years per decade from 46.9 ± 10.1 years in the 1970s to 57.0 ± 12.1 years from 2010 onward (P < 0.001). The female to male ratio (9:1) and antimitochondrial antibody positivity (90%) were not significantly variable. The proportion of patients presenting with mild biochemical disease (according to Rotterdam staging) increased from 41.3% in the 1970s to 72.2% in the 1990s (P < 0.001) and remained relatively stable thereafter. Patients with a mild histological stage at diagnosis increased from 60.4% (1970-1989) to 76.5% (1990-2014) (P < 0.001). Correspondingly, response to ursodeoxycholic acid according to Paris-I criteria increased; 51.7% in the 1970s and 70.5% in the 1990s (P < 0.001). Recent decades were also characterized by lower decompensation rates (18.5% in the 1970s to 5.8% in the 2000s, P < 0.001) and higher 10-year transplant-free survival (48.4%, 68.7%, 79.7%, and 80.1% for each respective cohort; P < 0.001). Conclusion: In recent decades, a pattern of primary biliary cholangitis presentation consistent with an older age at diagnosis alongside reduced disease severity has been noted; the observed trends may be explained by an increase in routine testing of liver function and/or a changing environmental trigger.